We arrived in Wacol Hostel in September 1961 and left about 2 years later in 1963 and moved to Inala, we stayed longer in the hostel than most as my father was one of the cooks in the kitchen, he worked there for about 8 years before opening his own cake shop in Goodna. Have many fond memories of the place, lots of kids from all over the globe to play with. The forts we built on the open land. The play battles we used to have with different nationalities, my little 2 year old brother getting hit in the head with a rock during one of these battles and requiring stiches. The shower and toilet block. The possum family that lived at the top of the furnace to keep warm, the tame kookaburra that used to visit us. My fathers first car, that rolled down the hill because he forgot to put on the hand brake and rolled into a neighbours hut. Thanks for adding your memories of the hostel. You must have been a bit older than me when you were there – it sounds like you remember a lot more. Your dad was probably still cook there while our family stayed in 1965/66. I’ve send you an email about the pictures. Just looking at some of your pics of the hostel and I realised you must have been next door neighbours to us. In the pic showing the two types of huts with the toilet block in the background we were in the hut to the right of your mum, on her left. I was 15 at the time so a bit older than you but no doubt we would have seen each other. We left in ’66 and lived in Sherwood before moving to NZ in late’66. So nice to see the old huts, they bring back so many fond memories for me. So many friends that have now grown old but are still young to me. G’day Kevin. Do you mean this photo? That’s amazing! What were your parents names? I’ll let Mum and Dad know. Your mum probably looked after me when I attended the hostel child care centre as a 3 year old in 1963. How do you get to the reserve that you speak about? What street gets you to it? I thought it was all taken over by the prison. Hi Neil, I’m Michael’s sister,Elizabeth,the one who used to deliver the newspapers on the camp with him. I remember balancing them all on my head as I did the round each day on M, L and J blocks and to where the administrative staff lived. I think I got the idea for balancing them on my head from a lovely Hungarian woman, Eidelweiss, who used to carry all the food for her parents, 3 sisters, a brother and herself, (from the canteen to their hut on M block) balanced on a tray on her head. How she did it, I don’t know, but she even carried billy cans in both hands, at the same time. I remember we arrived at the camp at night on a bus from the docks. We were taken, first of all, to the canteen where we had a lovely cup of hot chocolate and a piece of cake. We were then taken over to hut M14, later transferring to a hut nearer the canteen and the “new” washrooms. I remember Wheeties for breakfast: does anyone else? Also, really good packed lunches were provided for us school children, in brown paper bags. I can’t comment on the laundry facilities (although I’m sure I would have washed some of my clothes) but as a teenager (I was 14 when I arrived), I really enjoyed being on the camp. I remember one of the wives of a camp official, opening the wire mesh door of her hut on Easter Sunday, 1962 (just after I’d delivered their newspapers) and giving me a bunch of bronze chrysanthemums. I was thrilled.I also spent a couple of weeks or more in about November and December, 1961, stamping all the new towels and sheets with the camp logo. There were loads, of course, filling the nissen hut. The staff used to give me cream buns at morning and afternoon tea breaks. This particular nissen hut was not far from the recreation hut where we used to play ping pong and meet up with other teenagers in the evenings. I was interested in Louis’ comment about his father being a cook on the camp from 1961-9. As Michael has already mentioned, our Dad (Robin O’Leary) was a camp cook, too. I remember an Italian cook who worked with Dad as I was quite friendly with his son, Luciano. I hope others come across this site as I would love to read other people’s memories, too, and may even remember the people writing them. Thank you, Neil. I’m glad you thought of this. I’ve tried to revisit a lot of places from my childhood to try and refresh my memory. Sometimes it works. But it’s such a shame we can’t do that at Wacol, because they put a jail there. That’s why it’s so good to read other people’s accounts of their experience there. We arrived by ship (Fairsky) in 1963. There was my dad, mum, my brothers John (deceased), Nigel and sisters Elaine and Charlotte, my brother Julian was born at Wacol. (There is also Andrew and Natasha). I used to sell papers at the canteen and over in the Army camp over the highway. Attended Goodna State School and we eventually moved to Acacia Ridge and then Inala. I have so many fond memories and experiences from Wacol. I often wonder what happened o all my friends from the hostel. Sorry to hear about your brother, John. I remember the canteen and the Army camp across the highway. my family were there about 1961—i was only 8 but i remember lots of it, the bush and avoiding the tramps on the way to the swimming pool nearby. a girl that used to dance as a ballerina in a large hut. getting the cane at the convent (for nothing!!!). lots of freedom that would be unheard of these days. some sadness—a friend died in a cave in. also the strong smell of ddt for the mossies! How long did you stay at the Hostel? I’ll pass on your memories to my mum. by the way i remember the jackson family–there were about 13 kids. My family arrived to Wacol on the 20th January 1983. We had no english and was hard for my parents. On the other hand, although not easy, we kids found that the Community Centre ran within the grounds, and the nature that surrounded us, gave us a way to escape reality, play and grow up. I have good memories of this place, although I hated it for what it was, the destination after leaving my home. then we moved to inala. after a year there dad moved us to new zealand where we have all remained. We moved to Inala too. I think a lot of people from the hostel did. That’s where I grew up. I arrived with my parents and two siblings in December 1976 from Germany. It was very hot and steamy. We were placed in a wooden hut. The nights in that hut felt very uncomfortable in those huts. We met another German Family and we are still friends with them. Except for a little discomfort of sleeping in those huts we really enjoyed the food. One night when we were at dinner, plates were stacked up so high that the whole stack collapsed, leaving nothing but broken plates and cutlery on the floor. After a couple of days in Wacol Immigration Hostel we were placed in a Commonwealth Housing Estate in Wooloowin. It’s amazing what we remember as kids. Did your family stay in Brisbane? I arrived by plane on my own as a 12 year old in 1967 to join my Dad Frank the builder..some may remember him as he had a bad car crash and was in a plaster cast from his waste that covered his head after he broke his neck in a crash in Inala, he still worked and looked like an egg..we lived at C27 and i built a boat outside the hut as I was chucked out of Oxley state high..I had a brother bernie who was very popular and returned to england on the ill fated Fairsea whos captain shot himself and the boilers blew up leaving bern and the others adrift..(the good old days eh)..we stayed in c27 for just over 2 years but returned as there was not enough medical insurance but we built a big brick house out side bribane…I remember the bake bean sandwiches in brown bags with a piece of neoplitan cake and an orange..does any one remember Sam the old night watch man with his ex service revolver..or my once sweet heart marilyn dregmans in the shop..when we were there they put sinks in the huts with running water..it does seem a shame its all gone now and all the people I new that wacol love it or hate it, it was a part of the aussie adventure that pwrsonally as a kid i loved.. Thanks for sharing such amazing memories. My parents and I were accommodated here in the early 1950,s.I am only vaguely aware of my experiences here as I was 3 years of age. It was an interesting time for all of us. I think you were the boy I met at Wacol Hostel. Yes if it was you, I remember us arriving in 1969 and there was a boy building a boat. I think it was the language barrier that caused it, me being from holland, and I think you were english. Anyway Thinking back, I thought at the time you did a great job, considering you had no work shop to work in. I would like to correspond with you and talk about those time/s etc. I am married, have three grown up daughters and live on the sunshine coast. Hi there. wow you all have such amazing memories. I was a worker at Wacol in late 1980’s when the Vietnamese refugees where there. Then they started coming form South America. Do any of you know any people who would have been there then? I’m writing a short story and some facts would be handy. 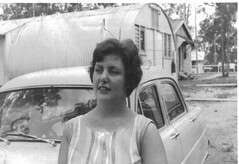 Hi Cate, we lived at The Wacol Migrant Centre, from June 1980 – June 1981. I worked as a cleaner and also sometimes in the nursery, so the refugees could attend English classes. We had twins a boy and a girl aged 23 months. I’m not sure if you can remember us living at the migrant centre. We were the only couple at the time with twins. After leaving the migrant centre, we lived in Brisbane for 5 years, then moved to the Northern Territory for 26.5 years, we now reside in Perth. My parents and eldest sister came from Denmark in 1957. My brother was born whilst they lived at the Hostel. I’m sorry to here the bad news. That’s fascinating about the aboriginal camp. I was there from November 1972 to probably March 1973. We did have a sink with running water. My parents Ray and June Musgrove brought my brother and i from England by plane in 1979, i was 4 at the time my brother was 7. I remember the heat, as we arrived in November of that year. We were placed into a wooden hut. I remember the canteen. I also remember we must have been there for a couple of years as they moved us from the hut to a block of brick units, which was so much better. We then moved to Inala. I would love to find out if anyone was in the camp at the same time, and if they knew my parents? As my parents passed away when i was young, not much memories as i was so young. We came to Wacol in 1961 immigrating to Australia from England on the Strathnaver as 10 pound poms. It was the ships last voyage after which the ship was scrapped. Our journey over was not the best as our cabins where way down in the hold and it was just so.. hot. On arrival in Brisbane we likened Warcol to a concentration camp made of corrugated iron after leaving our lovely new Council house in South East London it was a backward step. Many of my friends and their families were terribly unhappy at Warcol a few went directly back to England using all they had to get back home. My family and I only stayed a couple of weeks at Warcol as we had the money to rent a house in Fairfield. I was the only one working to bring in some money at the time I was 18 years old. My dad was a bricklayer but found a job in an abattoir all he could get. My mum found a job in a rag factory ripping up rags. We felt we had been brought out to Australia under force pretences really as it was nothing like what was portrait at Australia House London. As a family we never settled in Australia and after saving up for two years so not to pay the government back! we saved enough to make another new life in New Zealand where we all live now. Dear any former Wacol resident. I came to Australia as an emigrant in the Autumn of 1979 and was staying in Wacol emigration center . 1. Dung Thi Tuyet Lee (Could be spelled wrong) she was Vietnamese and lived there with her son who at time was 5-8 years old . 2. Any Danish people living there at the time. The website won’t let you embed images in your comment, but if you send them to mail@NeilEnnis.com I’ll upload a few at the end of this article if you like. My twin brother sent me this link, today, of your blog, which I will read later; as we ourselves mark our 50th anniversary of arriving in Australia on the 24th March 1968 – 50 years today on 24th March 2018. In the meantime, I wrote a little poem about our family’s arrival and what has eventuated since our arrival to Australia and our first impressions of when we arrived at the Wacol hostel… I look forward to reading your blog soon. I came to Wacol in early 1950, being transpported there from the camp at Greta in NSW. I arrived in Australia on the Fairsea, disembarking at Newcastle and sent to Greta in 1949. I wonder whether there are people who came at the same time and also being at both camps. Hey, my family arrived in 1969, my mum English and dad Lebanese, my brother was 3, Marcus and my mums water broke on the side of the road and a man helped her, I’m suzy, the baby. Haha, if anyone has photos of that time, I’d love to see them. Can you tell me what part of the year this had eventuated. I remember my father helping a family get into the hostel , who had an very old type of car, desperate to stay somewhere. they had completed a long trip and they were absolutely desperate and down on their luck.My parents approached the Hostel staff and petitioned to help this family, which was successful. I remember a knock on the door one night, whereby the man we helped had brought over a gift for my parents as a thank you for helping. let me know if you can remember what part of the year this was and describe the car or which seemed to be a type of ute from the 1930’s I am not sure. Regards Gary Tangeman. P.S. I wonder sometimes what happened to this family and how they are today. My family and I came to Australia on the HMS Ellanor in 1967/68 I was 5 or 6 at the time.I remember stopping at the Wacol migrant hostel for several weeks. I remember the huts and I know my Mum hated it but at such a young age I didn’t really take that on board. I loved it as there were lots of children to play with and sunshine two things that were in short supply for me in the UK. I remember that there was an army barracks opposite . My Dad was a builder and he went out to work everyday. We eventually got a house that was on stilts in Inala, which was very exciting to us. We arrived in September of 1969 from Ohio having traveled on the P&O Liner “Orsova”. My father told us not to unpack because we would be leaving in a few days. We stayed 7 weeks and enrolled at Oxley State School. Ended up buying a home in Sunnybank south of Brisbane. Sadly we returned to States in 1971. Our time at Wacol was special, in a hut with 4 children 4, 9, 12 and 14. I remember having school lunches with chocolate sprinkles and butter and breakfasts with hot milk and wheatabix. Truly an experience. Mostly British but I remember a family from Albania and twins from Argentina.